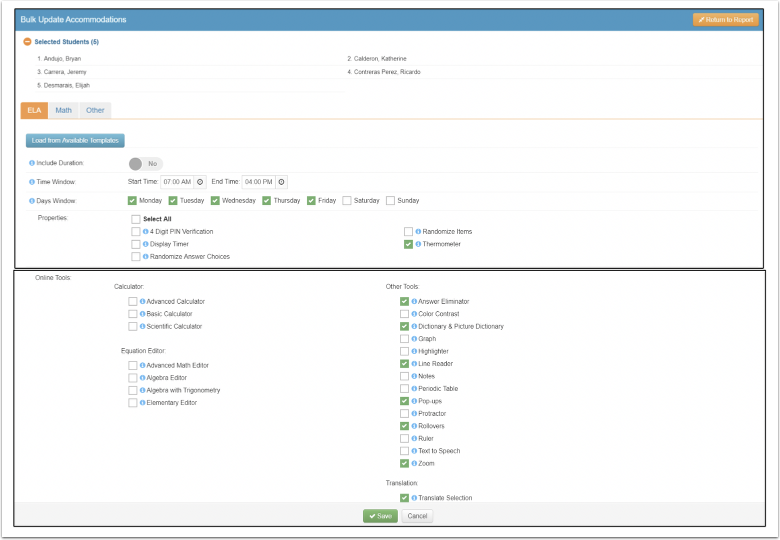 The Class Roster report allows users to view a roster of students for a course or classroom, including demographics, if desired. Users can set online assessment accommodations for individual students or groups of students, create student groups from the report, and obtain a student history of previous SchoolCity-tracked assessment/standards data. Note: Class rosters are refreshed every 24 hours by SchoolCity, as determined by the district’s Student Information System. From the Launchpad, select Reports from the grid icon. Please see the Help document, Basic Navigation Navigating the Launchpad 6.0, for more information. 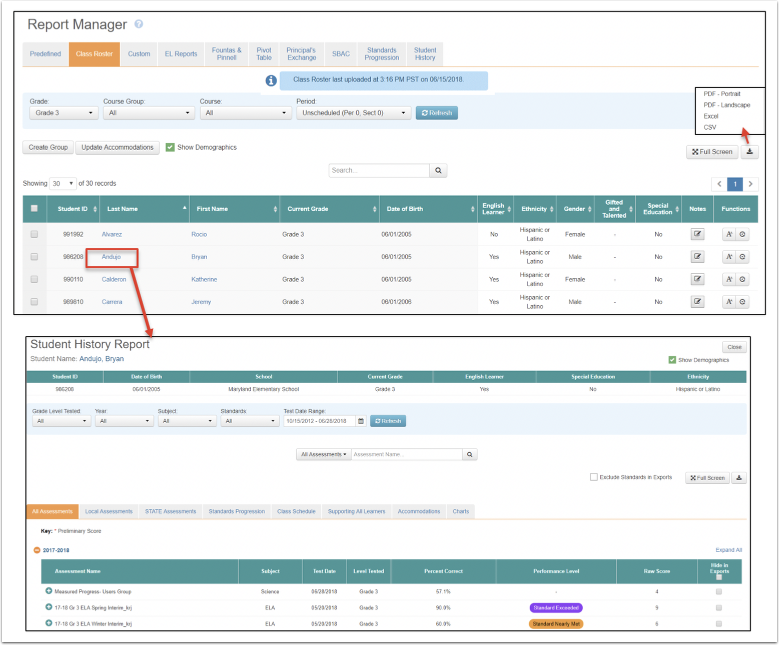 In the Report Manager, click on the Class Roster tab. Search for the desired roster of students by using the drop-down lists. Click Refresh to view the results. Create a Group: Group students for various purposes. Please see the Help Document, Groups: Creating A Student Group, for more information. 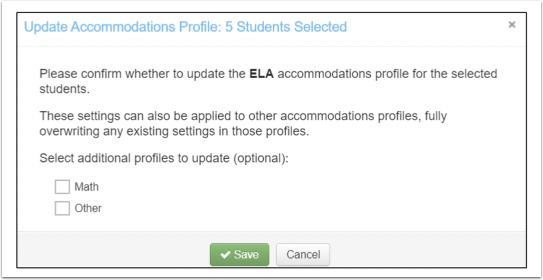 Update Accommodations: Create an online Accommodations Profile for individual students and/or bulk update accommodations for multiple students (See Step 4). Show Demographics: Uncheck the box to hide Demographics. Demographics shown depend on the district’s SIS. Search for a specific student on the roster by entering the student’s first or last name, and then clicking on the magnifying glass icon. Student roster with ID number, Last Name, First Name, Current Grade, Date of Birth, Demographics, Teacher Notes (See Step 5), Accommodations (See Step 3), and Accommodations History (See Step 3). View Full Screen: Click to view the report in full screen, then click on Exit Full Screen to return to normal view. Export report to PDF, Excel, or CSV. Go to the Student History Report for a student by clicking on the student’s first or last name. Reorder any column in the Class Roster Report by clicking on the header or on the up/down arrows. In the example below, students were reordered by last name, from the end of the alphabet to the beginning. Accommodation profiles for online testing may be created for individual students in the Class Roster Report. A profile may be created for ELA, Math, and Other subjects. The profile automatically applies when the student is activated for an online assessment in the subject. Click on the A icon to the far left of the student’s name under Functions. Click on ELA, Math, or Other, then click on Create. An Accommodation Profile may be selected from available templates (which are created at the District level). Click on Load from Available Templates. Or, an Accommodations Profile may be created specifically for the student by selecting the desired Online Properties and Tools, then clicking on Save. 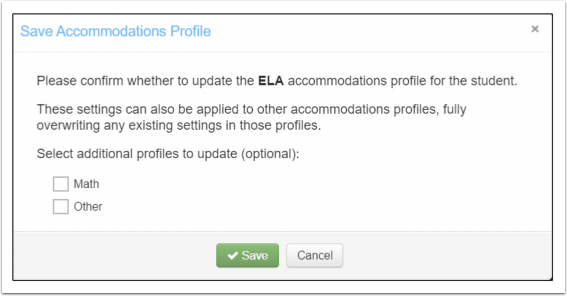 Once the first Accommodations Profile has been saved, a message appears giving you the option to add the same profile to the other subjects. Check the boxes for the other subjects and click Save, or just click Save to add this profile to the first subject only. You can view the Accommodations History for each student by clicking on the circle icon to the far right of the student’s name under Functions. The history will display with the Activity Date, Activity, and the User’s Full Name who completed the Activity. The Accommodations Profile will be automatically applied when the student is activated to take an online assessment for the selected subject. To view and/or edit the profile, click on the A icon to the right of the student’s name under Functions. The student’s Accommodation Profile shows all selected properties and tools in red. These settings may be edited as needed to temporarily override the original profile for this particular assessment. However, the student’s profile will revert back to the original settings after the assessment has been submitted. Student Accommodation Profiles may be created and set in bulk for multiple students at once. Select the students by checking the box to the left of each student’s name. Then click on Update Accommodations. Select the Online Properties and Tools needed by the group of students. For example, all English Learners may need all tools that support the reading of text, including the Translation Tool. Click Save when finished. Confirm the settings for the selected subject and apply to other subjects as needed. Click Save. Please see the Help document, Administer Assessments: Student Accommodations for Online Testing, for more information. Users may include notes about students for various purposes. Click on the Notes icon to the right of the student’s name. 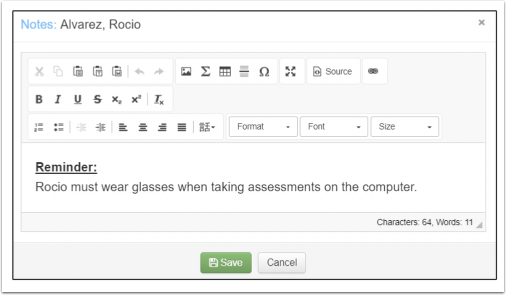 In the CKEditor text box, type your notes, then click Save.